During a weekend in Denton, a bevy of twenty-somethings are packed into a house that doubles as a show venue, dancing to the band, catching up with friends and nursing a beer throughout the night. The bands arrive, set up, play and leave the makeshift stage like clockwork. Regina Bugarin, a 23-year-old talent buyer, plays an integral part in organizing these shows each night. Bugarin started booking bands for events like these three years ago and began booking tours over the summer. Bugarin works alone but gets help from friends and “internet friends” booking out-of-state ventures. Cat McCrorey, a 24-year-old friend of Bugarin, also books bands for local shows. McCrorey said the interpersonal connections talent buyers create make up much of their jobs. After a brief stint managing the band Hey Cowboy over the summer, Bugarin became more interested in acting as an agent for a band. However, she said that she must be a fan of whatever band she ends up working with. The relationship between a band and its promoter is all about collaboration. Bugarin said that open communication is one of the many things necessary to make things work. Sabrina Tionloc, the 19-year-old bassist of the band Manifest Destiny’s Child, describes Bugarin as a great friend who has a skill for scheduling shows that are both intimate and larger in size. Tionloc echoes Bugarin’s sentiments about collaboration between bands and those on the business side of the industry. 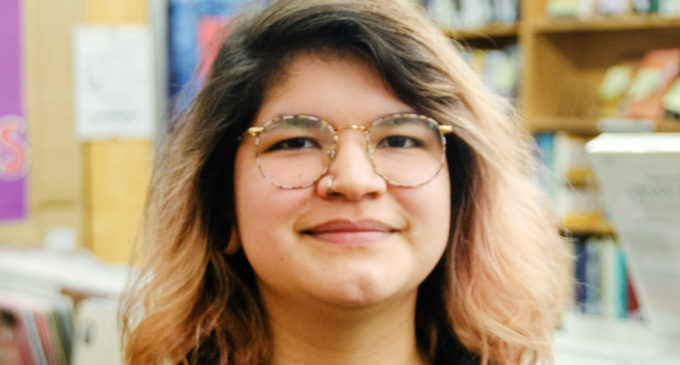 She feels that the two entities make the Denton music scene possible. With a growing number of people from Denton’s local music scene moving to either Dallas or Austin, Bugarin has also thought about making the move to Dallas but doubts she will any time soon. Though Bugarin loves house shows and the activity they bring, she acknowledges there are aspects of them she does not agree with. She said the “party culture” partly stems from the reputation that Denton has for parties, which incoming college freshman come to expect once they arrive in Denton. In the end, it all depends on each house venue. McCrorey thinks Bugarin has a long career ahead of her in the booking and promoting field and is proud of the work she has done so far. Featured Image: Regina Bugarin is a local band promoter who has worked with groups like Hey Cowboy! and Sad Cops. She started promoting when she was 20 years old. Image by: Jacob Ostermann.